You will have the opportunity to add any one of these fabulous packages at check out, after having booked your chalet. You can have 3 fantastic activities at Tyroparc. This site in only at 7 minutes drive from your chalet. Starting with a 1.3 km hike in the white trails of Mont Catherine forest, take the time to warm up next to the fire in the tipi before going down the mega zip lines at about 100 meters above the ground from one side of the mountain to the other and back. Pleasure and excitement guaranteed! You will start the activity by taking a 450 meter hike from the chalet to the foot of the cliff of the Cap Beauséjour and the start of the Via Ferrata. From there you get into the ascent of the rock wall of over 60 meters high, the equivalent of a 20 floor building. Along your path on the continuous life line, on top of steps and handles you will also cross different types of bridges, all allowing you to reach the top of the cliff. Thrills guaranteed. 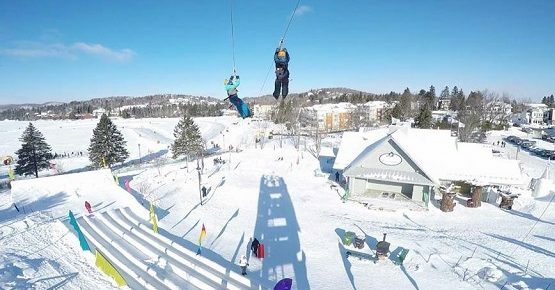 At the top, (or on your way up if you are game), you can admire winter views of the entire region of Ste Agathe-des-Monts. From the top, you will go down the mountain on a hike of about 700 meters to reach the Tyroparc base camp. You will start the activity by taking a 450 meter hike from the chalet to the foot of the cliff of The Cap Beauséjour and the start of the Via Ferrata. From there you get into the ascent of the rock wall of over 60 meters high, the equivalent of a 20 floor building. Along your path on the continuous life line, on top of steps and handles you will also cross different types of bridges, all allowing you to reach the top of the cliff. Thrills guaranteed. At the top, (or on your way up if you are game), you can admire views of the entire region of Ste-Agathe-des-Monts. From there, after a short hike on the cliff top, you take your first flight on our highest and longest mega zip line, at 115 metres above the ground and 900 meters long, to the other side of the mountain. After that, no need to hike, your guide will hook you up for your second flight of 650 meters, which brings you back to the the foot of the cliff of the Cap Beauséjour. The table will be set for your arrival and the fireplace will be ready to light! #1 The Half / Half : The most popular recipe in Western Switzerland. Blend of Gruyere and Vacherin Friborg mixed with white wine, garlic and kirsch. A pronounced taste for incomparable smoothness! #2 The Swissesse : Original Swiss recipe with Gruyère, Emmental, white wine, garlic and kirsch. #3 The Edelweiss : Our original Swiss family recipe with Gruyère, Emmental, white wine, garlic, kirsch and top secret blend of herbs and spices. Unique in the world! #4 The Brassicole : Recipe of original and artisanal Swiss fondue accompanied by red beer from microbrewery. The perfect marriage between Switzerland and Quebec! #5 The Valaisanne : Swiss recipe with Gruyère, Emmental, white wine, garlic and kirsch with a subtle blend of tomatoes and spices. 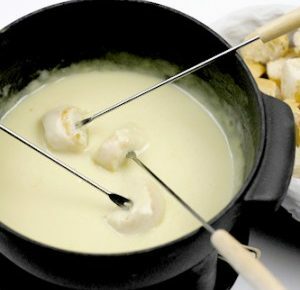 Eat like a classic fondue! *All cheese fondues are garanteed lactose-free and gluten-free!